One of the joys of hiking and traveling is the beautiful sceneries and moments one gets to enjoy. If you will be bringing along the best camera to capture your discoveries and experiences wherever your adventures take you, you will also need the best camera backpack to comfortably carry your photography equipment while protecting it from the elements and giving you quick access whenever a shooting opportunity presents itself. To help you find and select the right camera bag to suit your camera and adventures, we’ve reviewed ten excellent camera backpacks for hiking and travel. 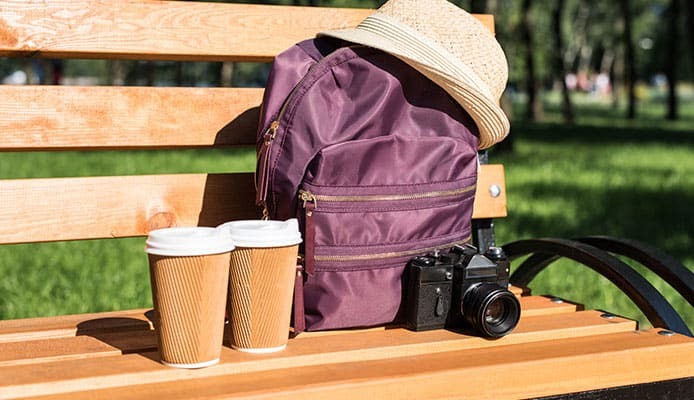 They have everything you want in a camera bag for outdoor use when on the move – they are comfortable, rugged, weatherproof, protective, stylish, and more. We also go over the features to pay attention to as you evaluate photography backpacks. Ready to go? Let’s get started with reviews of our top ten picks. This is a bargain travel camera backpack but a very nice one. It is the best if you're on a budget and won't be bringing along a large and heavy gear load. It can take 2 smaller SLR/DSLR camera bodies, a couple of lenses, and a bunch of smaller accessories. If you carry a lot of photography gear, this isn't a big camera bag and you should probably go for one of the high capacity and stronger packs on this list. Storage: This backpack is small but pretty roomy with plenty of compartments, pouches, pockets, and straps. The main compartment has two full-length dividers then six velcro dividers with straps to secure items. You can customize the configuration of the cells to suit your needs. Smaller accessories like batteries and memory cards go into the two zippered interior pockets. The big front pocket can hold a laptop if you will be bringing one along. Comfort: This backpack is comfortable to wear on the go even when fully loaded with heavy photography gear. There's heavy padding at the back and on the carrying straps. It won't dig into your shoulders or feel lumpy on your back. It also has a wide, adjustable waist strap and adjustable sternum straps. Durability and Protection: Made from a rugged polyester/nylon fabric, this is a sturdy pack that holds up well. The main compartment is lined with foam and the compartments are padded to cushion the delicate gear they contain. The dividers are made of a thick, medium density material. 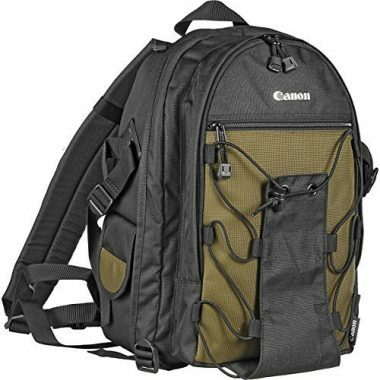 As you can expect from Canon, this is a top-notch quality backpack you can rely on to carry your expensive camera and lenses. It is designed for Canon EOS SLR cameras but it also accommodates other camera models by different brands such as Nikon. It can hold two smaller SLR camera bodies, 3-4 lenses, and has plenty of pockets for other things such as memory cards, batteries, chargers, filters, cleaning kit, USB cables, a small tripod, and personal items. Storage and Protection: The interior has padded dividers for organization. The partitions for camera/lens storage are removable and you can easily configure the compartment to how you prefer it. There are also zippered pockets and sleeves for an assortment of gear. The internal padding ensures the items don't bang against each other when moving. The only weakness here is that the tripod straps can only hold a small tripod. 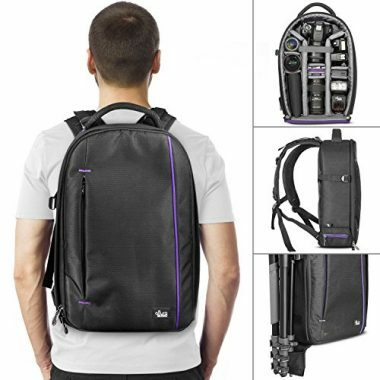 Comfort: With wide and bulky shoulder straps, cushioned back section, and an adjustable chest strap, this is a comfortable backpack to carry for prolonged durations on the go, even when it is fully loaded with shooting equipment. Durability: The fabric is polyester and nylon coated with urethane. It is weatherproof, water repellant, and rugged enough to take hiking in the wild and end up without rips, frays, or tears. The sewing is strong and the compartments are sturdy. Its camera backpack reviews by owners say it lasts years in good condition. It is definitely a solid investment. As you can tell at a glance, Altura Photo is offering a quality travel camera bag for DSLR and mirrorless cameras with this Wanderer pack. This first impression is not deceiving, as this is a top rated camera backpack for hiking and travel for its streamlined design, elegant, modern style, wearability, functionality, space, and comfort. 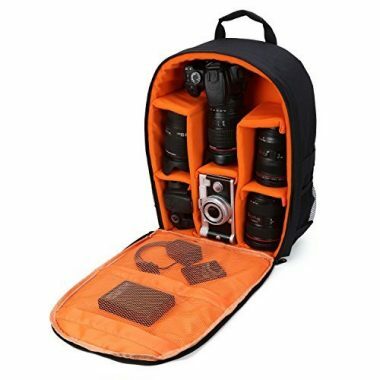 It is a mid-size bag that holds one DSLR or mirrorless camera with an attached lens, 4 to 5 extra lenses, a flash, a tripod or monopod, a laptop, and camera accessories. For airline travel, it meets TSA carry-on specifications. Storage and Protection: The inserts are removable so you can arrange them in a way that will work best for you. It has plenty of small pockets for accessories. On the side is a well-designed tripod holder that is made up of a small pocket for one leg and straps to hold the tripod securely. There is a laptop sleeve that accommodates laptops/tablets up to 14-inches built into the front flap. The tough fabric shields your equipment from the elements while the foam padded inserts keep them from bumping against each other. To deter thieves, the zippers connect for locking and you can use standard luggage locks. Comfort: This backpack is comfortable to wear on the go even when full of gear. The carrying straps are wide and thick so they don't dig into shoulders and you can adjust them for a perfect fit. Durability: This is a sturdy bag made from a water-repellent and weather resistant 840 Denier nylon. The stitching is reinforced at points that take the most beating and the bag holds up well even when bearing a lot of weight. Thoughtfully designed with the photographer on the move in mind, this CaseLogic camera bag is the ultimate in versatility and functionality. It will not only carry and protect your SLR camera body with attached lens and the essential camera accessories, it also has a built-in laptop sleeve large enough for up to 15.6" PCs or up to 17" MacBook Pro. And if you will be doing aerial photography using a drone, you can also fit in your DJI Mavic Pro or any other drone up to 320mm x 270mm x 140mm in size. It has everything the best camera backpack for hiking and travel should have and more. Fearful of your expensive equipment getting damaged on the road or trail and want all the protection you can get? This one offers it. The camera is elevated and protected in a unique hammock-like suspension system, the pack is rugged, the base is rigid and the interior is thickly padded. It also offers fast access, is comfortable to carry and doesn't need to be checked in when flying. Storage and Protection: A hammock-style suspension system keeps the camera suspended protecting it from impacts and offering fast access while the side and front accessory pockets offer convenient access to the frequently used items. The camera compartment is fully customizable, as the dividers come out. There are strong tripod straps on the side and a nicely padded and big laptop compartment. This bag offers a lot of protection to its contents, as the interior has thickly padded memory foam gear shelves. Comfort: The shoulder straps and lumbar pad that rests on your back are padded and covered with mesh to ensure your back stays cool. This makes for a very comfortable wear even during a rigorous activity such as hiking. 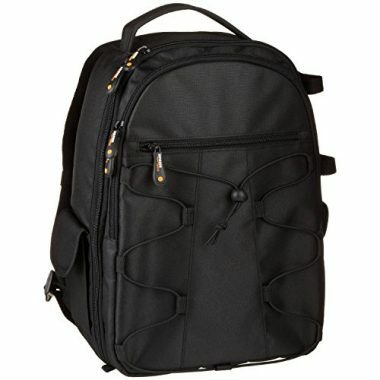 Durability: Case Logic quality is reliable and this bag is sturdy and durable. The nylon material and components are strong and the construction is reinforced. The rigid EVA bottom is stable and water resistant so you can set the bag down without worrying that it will tip or that moisture will penetrate into the interior. 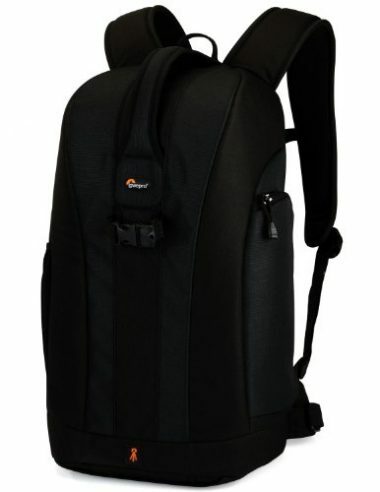 The Lowepro Flipside 300 is a top rated camera backpack for hiking and travel. Its standout feature is the flipside body-side access that offers security, easy access, and convenient lens changes without having to put the pack down. It is also very comfortable to carry, rugged and protective of its contents, the perfect size for photography equipment needed on the go and for carry-on luggage, and the urban design does not scream 'expensive camera inside'. For an idea of how much you can carry in it, it can accommodate a pro DSLR with lens attached (up to 80-200mm f/2.8), 2-4 extra lenses or flashes, tripod, accessories and small personal items you need when moving. Storage and Protection: The camera compartment is customizable so you can configure it to suit your preference. It has a front storage panel for miscellaneous items, a mesh side pocket, and a very nice tripod mount composed of a pouch and straps. A removable accessory pouch for extras and SlipLock attachment loops offer extra storage options. Everything packed inside is secure thanks to the rugged exterior, heavy padding on the inside, and the flipside design where it opens from the side facing the body. This design also offers convenient access to your gear and makes it easy to change lenses without having to take the bag off. Also, the discreet design doesn't make it obvious that it is a camera bag, which prevents theft when in urban areas. Comfort: The pack is very comfortable even on long hikes and travels that involve a lot of walking. The shoulder straps are thick and wide and the back side is well padded ensuring no lumps will press your back. It has a removable waist belt and adjustable sternum strap for comfortable weight distribution. Durability: As obvious from the looks of it, the overall quality and durability of this backpack is very high. The material is tough and the zippers are sturdy and silent in their operation. 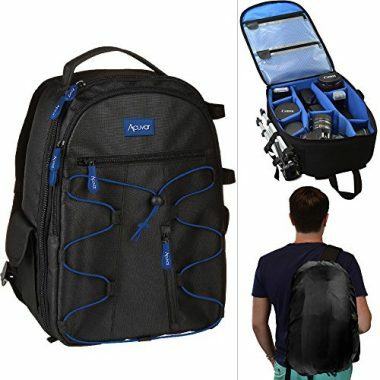 This compact camera backpack by Acuvar is the perfect size for travel and outdoor adventures. It is a nice, inexpensive bag for basic use carrying light gear and for short trips. Its size and weight make a great camera bag for backpacking and hiking. It is not for really serious pro photographers or intense outdoor use. While fairly small, the storage spaces offer more than enough room to hold 2 DLSR cameras or 2 small camcorders, 3-4 lenses and other accessories such as flashes, filters, batteries, cards etc. The best thing about it is its versatility. It is compatible with Canon, Nikon, Sony, Olympus, Samsung, Panasonic, and Pentax camera models. Storage and Protection: You can remove or arrange the dividers according to the way you want to organize your gear inside. There are lots of compartments, pockets, and straps to hold a small tripod. This backpack is sturdy and protective. The inside of the bag is soft and cushioned using thick foam shielding the equipment from bangs. If it starts drizzling all of a sudden, there is a detachable rain cover stored at the bottom of the case to keep your gear dry. Comfort: With adjustable straps at the chest and waist and padded shoulder straps, toting it around on one's back is comfortable, even for long walks and hikes. Even the back area that rests on your back is cushioned and you won't feel the hard equipment pressing on your back. Durability: Given its price, this backpack is surprisingly well made. The fabric is a strong nylon/polyester. The zippers are sturdy and covered with leather flaps to ensure they don't scratch the equipment. This USA Gear S17 is a high capacity travel camera bag for serious outdoor photographers that need to haul a lot of photography stuff and need a camera bag for camping somewhere and setting up a mini studio outdoors. It has room to hold a wide assortment of camera gear from the camera, lenses, memory cards, batteries, adapters, and more. It also has space for a laptop or tablet up to 15.6". Even with this kind of storage room, it still manages to be compact enough to be easily portable and suitable for hiking and traveling. It also has protective features to keep the equipment safe, offers quick and easy access and has comfort features to make the heavy gear load easy to bear for extended durations on the move. Storage and Protection: The camera compartment is huge and can hold a huge camera and a plethora of lenses. You can remove, add or reorganize the dividers to suit the kind of shoot you're working on. 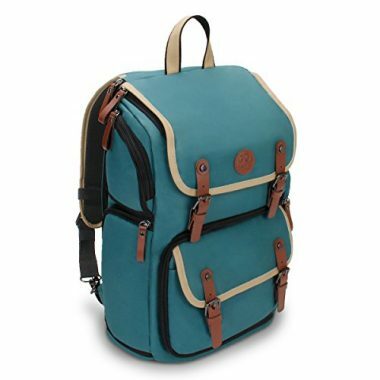 It also has many compartments, pockets, a laptop compartment, and a tripod foot pocket and strap. The dividers are well padded for protection against accidental bumps and scratches. Side and front opening offer fast access to the camera. The zippers have non-slip rubber pullers for ease of handling. Comfort: To ensure that this bag is comfortable to carry when loaded with heavy gear, it is equipped with a waist strap to distribute the load, a chest latch and strong, padded shoulder straps. The back area also has foam padding to ensure it is not painful to wear. Durability: For a camera bag of this high capacity, it is essential that it is sturdy and durable so it can hold the expensive gear securely. This backpack does not disappoint here as it features strong nylon construction, reinforced straps, handle and zippers. The buckles are also heavy duty. It is weather resistant and also comes with a rain cover for additional protection during rain or snowfall. 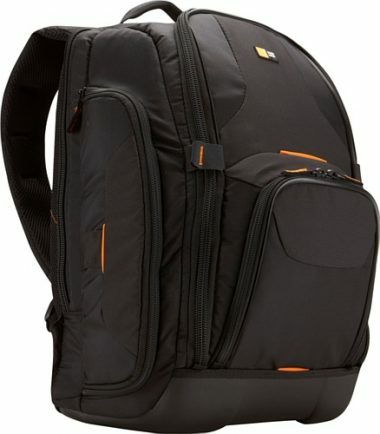 Looking for a decent camera backpack that doesn't cost a lot? This one fits the bill. That it is small, lightweight, rugged, and affordable is what makes this among the best camera backpacks for hiking and travel. It is great for beginners and casual photographers. It is also versatile and can be used as an everyday or school backpack making it a good all-around backpack. Storage and Protection: The main compartment is quite spacious and the dividers are adaptable. In addition, there are plenty of pouches, zippered pockets, compartments, and adjustable tripod straps. The solid exterior and adequate protective padding on the inside keep the equipment protected when traveling. It is also good that the versatile design doesn't make it obvious that there is a camera inside. Comfort: Very lightweight, compact and equipped with adjustable, heavily padded, shoulder straps, this backpack feels comfortable on the back even when walking for long distances. It is a very comfortable camera bag for backpacking. Sick of the simple black look that camera backpacks usually have and looking for another color option? 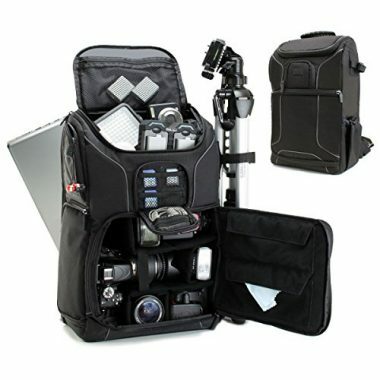 You will love this unique and stylish DSLR camera backpack by GOgroove. It has room for your camera and lenses, laptop, and photo accessories. It fits Sony a6000, Canon EOS T6, and Nikon D5500. It is a great camera bag for camping, hiking, traveling and even everyday use. Storage and Protection: With the personalizable camera compartment, multiple compartments and pockets that it has, it is easy to stay organized when using this pack. Ease of access to the main compartment is provided by the side zipper. The laptop compartment can fit laptops and tablets of up to 15.6". It also has straps and a foot holder for a compact tripod. The dividers are thickly padded to keep everything protected. A handy rain protector is also included to protect the pack content against weather elements. Comfort: On your back, the backpack will feel comfortable even on long walks as the carrying straps and back section are padded. No matter what size you are, you will be able to achieve a great fit. The shoulder straps adjust up to 45 inches. It also has a waist strap that adjusts up to 14 inches. You can choose to wear this bag on both shoulders, on one shoulder as a camera shoulder bag, or even across your chest as a sling. Just stow away the straps you don't need into the luggage handle slot. Durability: The material is a strong, water resistant and easy to clean. The zippers, handle and buckles are reinforced. This is a high-quality pack that holds up well and should last for a while. GOgroove has even backed up this backpack with a three-year manufacturer's warranty. A top quality camera bag is a great investment for the avid outdoor adventurer and photographer and this Lowepro ProTactic 450 AW is the best camera backpack to invest in. It will accommodate all your outdoor photography equipment whether you're hiking in the wild or shooting in a city and is strong enough to hold the load securely and feel comfortable on your back and shoulders. It has room for one or two Pro DSLRs, (one with up to 70-200mm f/2.8 lens attached), 8 lenses/speed lights, a 15" laptop, tripod and the other photography accessories. If you're into drone photography, you will also be able to fit a drone like the DJI Mavic Pro. As for quick access, it gives you three options: left, right and top. And it fits under an airline seat so its a great carry on. 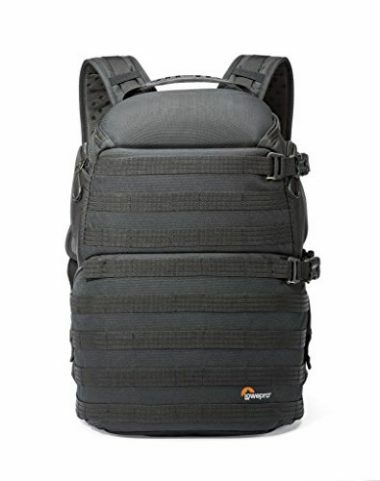 With the ample space, the versatility, the ergonomics, and the durability, Lowepro has done a fantastic job with this bag and we think it is among the best designed camera backpacks you will come across and worth every dollar. It is a favorite for many photographers and a top rated camera backpack for hiking. Storage and Protection: The camera compartment has adjustable Velcro dividers that give you the flexibility to customize the layout so it works best for your needs. It has multiple interior and exterior pockets. It also comes with a laptop pocket, water bottle attachment, a tripod pocket and straps, an accessory pouch, and Molle system straps for attaching third party accessories. You don't have to worry about your dear equipment getting damaged, as it is protected by the rugged exterior and cushioned interior lining. The full opening is on the back for security. This bag is also compatible with Lowepro's proprietary Sliplock system. Comfort: With this pack, carrying everything you need on your back is comfortable. The carrying straps are thick. There's serious padding against your back section, which is also ventilated to keep your back cool. This removable waist belt helps with weight distribution and has two storage pockets. Durability: The ProTactic 450 has it. It is equipped for rough use in the wild and for frequent travels. Like you can expect from LowePro, the build quality is top-notch. The fabric, stitching, zippers, straps, and buckles are all high-quality and heavy-duty. This pack is strong and rigid and keeps its shape even when fully loaded. Internal stiffening adds to its rigidity. The included rain cover is part of the bag’s bottom cushioning and comes handy when it drizzles or snows. This backpack should serve you for years to come. The best camera backpack comes down to personal preference but you will want to make sure it checks some boxes of what constitutes a great camera bag for hiking and traveling. Some of the must-have features include durability, adequate capacity, comfortability, quick access, ability to keep your precious camera and accessories safe, and of course, style. Below is an overview of the factors to evaluate when shopping in order to choose the right camera bag with the features, functionality, and durability you need depending on what kind of photographer you are and the camera gear you will be carrying, and the kind of environments you will be shooting in. This is a backpack you will be using to carry hundreds or even thousands of dollars worth of camera equipment outdoors and on the move. It will be exposed to harsh weather elements, rough handling in airplanes, and abrasive surfaces. Ruggedness and durability are a must-have in a camera backpack for hiking and travel. To ensure that you choose a bag that will hold up well to demanding usage in challenging conditions, pay attention to the quality of the material, zippers, straps, and stitching. The material a travel camera backpack is made of should be tough, weatherproof and resistant to abrasion. Canvas, leather, and strong nylon are both strong materials up to the task. Since the backpack is going to be loaded with heavy equipment, the stitching should be top-notch quality so the bag can contain the gear without coming apart at the seams. You will also be opening and closing it frequently, and it is important to ensure that you go for one with heavy duty zippers that work flawlessly. The straps and buckles should be robust enough to handle the strain of supporting heavy camera gear for extended durations on the go without failing. For a rough outdoor environment and frequent travels, you may have to pay more for a high-quality backpack that is built to last but it is definitely worth it, as it will offer you the best value for your money. Cheap, poor quality ones wear and tear out fast and you don’t want to find yourself shopping for a replacement after only a few trips. To get the right size, determine your size needs and ensure the dimensions of the bag you want meets them. The size you need will depend on the dimensions of the camera you use, the kind of lenses you will be using, and what other photography equipment you’re going to be carrying. Make sure the camera backpack you pick is big enough for all your camera gear and accessories to fit in. If you have a pro camera, big lenses and will be bringing along enough accessories to set up an outdoor mini studio wherever your adventures take you, you will need a large photography backpack. Given that this is a backpack you will be using when traveling and hiking, a compact size that is easily portable is necessary. 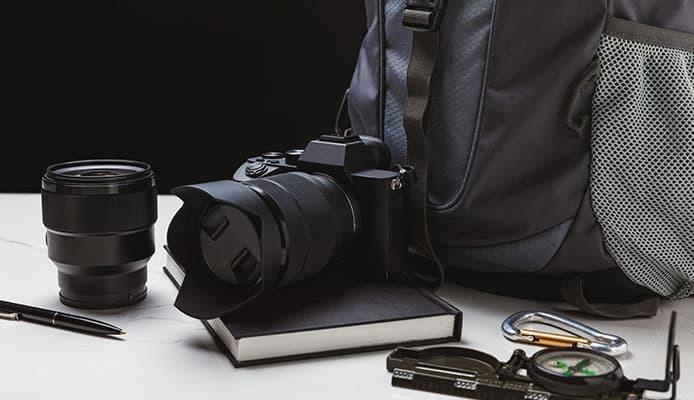 A meticulously designed camera backpack will utilize strong and durable materials, be spacious enough to accommodate your camera, lenses, photography accessories, and even some personal items, and still manage to be compact and portable on your back. This is exactly what you want. The right size will also depend on the kind of adventures you will be bringing it along on and how you will be getting there. If it is a camera bag for camping where you’re traveling by car, you can carry a large bag that will enable you to fit all kinds of equipment and shooting accessories. A camera bag for backpacking and hiking needs to be lightweight and compact so it is easy to carry and doesn’t wear you down. Will you be traveling by air and prefer not to check in your camera bag? Make sure you get a travel camera bag whose external dimensions are within airlines requirements for carry-on luggage. One that will not only fit in the overhead luggage but also fit under an airline seat is best camera backpack for airline travel. Too big a bag will need to be checked in and the rough handling can damage your precious photography gear. Another size aspect that you’ve got to consider is fit. You want to ensure you get a camera backpack that will fit well on your back, whether you have a petite build or are full figured. If there the backpack has a waist and a sternum strap, ensure they will fit around your waist and chest. The shoulder straps should also be large enough to fit and adjustable. When it comes to gear for hiking and traveling, lightweight is always ideal. Every ounce counts and heavy gear can become a burden on the trail or road and lead to sore muscles and ruined adventures. This is also the case with a camera backpack. However, this shouldn’t be at the expense of quality, comfort, and durability. The challenge is that the thick padding, heavy duty zippers, straps and buckles, and rugged materials that ensure a camera bag is comfortable to carry, durable and protective of the photography equipment it holds also add to its weight and bulkiness. The best camera backpacks for hiking and travel are meticulously designed and constructed to offer quality, comfort, and protection while still keeping the weight of the backpack down. They are heavy duty as required while also being light to carry and handle. This is because the manufacturers utilize space and materials efficiently. The interior of a camera backpack is divided into sections using inserts to make it easy to organize your equipment for protection and quick access. Some also have easy access compartments, pockets, and pouches on the outside. If you’re really serious about the quality of photos you take when traveling or hiking, you will need to pack a lot of photography accessories such as multiple lenses, filters, memory cards, lights, batteries, and a tripod or monopod. The best camera backpack for you will have storage options that will enable you to organize your gear in separate pockets and compartments in order to keep them intact and scratch free. Most also have a pouch to hold one leg of a tripod and straps for secure attachment. If you want to carry your laptop in your camera bag, you will need a backpack with a compartment designed specifically for a laptop. Not all camera backpacks have a place for a laptop so it is important to confirm that the pack you get has one. Also, ensure the compartment is large enough to hold your laptop. If you’re a minimalist adventurer, prefer to pack light, and don’t need to carry a lot of accessories, you may also prefer a minimalist and discreet pack that doesn’t have a lot of compartments and pouches. As you shop, you will come across camera backpacks of all manners of styles, designs, and colors. If you want simple and practical, most camera backpacks cater to you as they come in black and simple, plain design. If you prefer a cool design and attractive color, you can also find stylish options that will catch your eye. The style is a matter of personal preference. You’re free to pick what you like and will feel good carrying. Just ensure that it also fulfills your needs and has the essential qualities such as comfort, durability, and ability to protect your gear. For safety when traveling in urban and crowded areas, a sleek, urban-style backpack that doesn’t look like a typical camera bag is the best as it won’t make you a target for theft. The best thing is that such a bag will also be versatile and you can use it for other things as well. Cameras and photography equipment don’t come cheap yet they are very delicate and susceptible to damage. When on the go traveling or hiking, you will be using them in demanding outdoor environments and exposing them to all kinds of camera enemies such as moisture, dust, sand, physical trauma, and thieves. You need a high-quality and rugged camera bag that you can rely on to keep your fragile camera, lenses, laptop and other accessories protected from all these elements. Weatherproof construction is essential. The backpack should be made from rugged, water, weather, tear, and abrasion resistant materials such as canvas, leather, and high-density nylon. The zippers, seams, and buckles should be strong and function well in order to hold the expensive equipment inside securely. The pockets, compartments, zippers, and seams should be sealed. A built-in rain cover is also a nice feature that will offer additional protection in the event of rain and snow. The inside of the bag should be just as protective as the exterior. Rigid storage spaces and dividers with substantial padding will absorb shocks from physical trauma in case of impact ensuring the equipment remain intact. The internal padding also prevents the contents in the backpack from banging against each other while moving. Quick access options also offer protection by making it possible to grab whatever you need quickly without exposing the rest of the equipment to the elements. There’s also the possibility of a thief unzipping or cutting your bag and making away with your camera. Thieves really love cameras and a backpack that is obviously carrying camera equipment will make you vulnerable to theft. To avoid losing your precious camera this way, opt for a low profile pack especially if you will be traveling in crowded, urban areas. You can also find travel camera bags with security features such as latches, locking zippers, and a tough material that can’t be cut easily. These features can make it a lot harder for a thief to get to your equipment. In addition to the external dimensions, weight, and compartments considerations, you will also need to check how much gear the bag is built to handle. Determine what you be carrying and make sure the capacity of the camera backpack you’re considering will support the weight of all your gear. All the best camera backpacks in our camera backpack reviews above can fit at least one camera with lens attached, multiple lenses, photography accessories, and some personal items. They also have straps for tying a tripod or monopod on the outside. Most also have a padded laptop compartment. The capacity you need will depend on the dimensions of the camera you use, the kind of lenses you will be using, and what other photography equipment you’re going to be carrying. If you’re a serious photographer and want to take only professional quality shots, you may need to pack a large pro camera, a number of expensive lenses that are also large, and an assortment of photography gear. You will need a large capacity camera bag to accommodate all these. If you will be doing aerial photography and need capacity for a drone too, ensure you choose a bag that will accommodate the drone you will be using. If you photograph for fun and will be taking with you only a standard DSLR camera or a simple point-and-shoot camera, a selfie stick and a few accessories, you don’t need much capacity. Camera gear is heavy, and when traveling, hiking or backpacking, you will have your camera equipment on your back for hours at a time. It is vital to consider how comfortable a camera bag will be. A backpack style camera bag is the best way to haul heavy camera gear comfortably because of the way it distributes the weight to your shoulders, back, and hips. It is more comfortable than a camera shoulder bag or a sling pack. To determine if the backpack you like will be comfortable fully loaded and on your back for hours on the move, look for an ergonomic design that sits well on your back and distributes the weight across your shoulders and to your waist well. Wide and sufficiently padded shoulder straps ensure you don’t end up with shoulders. A nicely padded back panel will protect your back from being hurt by the hard gear inside. Good ventilation at the back will also ensure your back stays cool and dry. When carrying pounds of gear on your back all day, a thick, wide and adjustable waist and chest straps will help with support and weight distribution will make the backpack comfortable to wear. Camera backpack reviews by other hikers and travelers will also give you a good idea of how comfortable a camera backpack is on the road or trail. You also have to consider how easily and quickly you can access your camera. When hiking or traveling and shooting on the move, quick and easy access to your gear is essential. When that perfect photo moment presents itself or you notice the perfect natural lighting on the street, you need to be able to access your camera and equipment fast enough before the opportunity is gone. You also need to be able to change lenses without going through a lot of hassle. The way some camera bags are designed, you have to take the bag off, set it down, fiddle with zippers and fumble around to gain access to whatever you want. On the road or trail, this can get frustrating and lead to missed photo opportunities. Take a moment to think about how and where you will be using your equipment and what kind of access options would be the most convenient for you. When shopping, make sure you assess the kind of access options a backpack offers before you hit the order button. The best camera backpacks for hiking and travel will have an intuitive or customizable interior layout, quick-access panels on the sides, external pockets and compartments for organizing smaller, frequently used accessories. The zippers and buckles will also function smoothly. All these features make it possible to quickly reach your camera and other items you need without setting your bag down or rummaging. Ensure that the backpack you pick is compatible with your camera model. Some camera backpacks are designed for specific camera types or models while some work for a variety of camera types, models and brands. The best camera bag to contain and protect your camera on your hiking and travel adventures will also depend on the camera dimensions and the size of lenses. Ensure the camera backpack you pick is spacious enough and has the capacity to carry them. For example, the best camera bag for a point and shoot camera isn’t the same as the best mirrorless or DSLR camera backpack. If you have a drone camera, you will need a bag that can accommodate the drone too. Q: Why Do I Need A Separate Backpack For My Camera? A: The best way to carry your camera is in a separate backpack that’s designed to protect it from weather elements and physical trauma. A camera and its accessories are most likely the most fragile gear you will be carrying along on your adventures. They are also expensive and very susceptible to damage and theft when on the move. Bundling the camera and lenses in your hiking backpack or travel luggage together with the rest of your gear would be a really bad idea that you would come to regret. You will also need frequent and quick access to your camera and other photo taking gear and having a separate backpack designed for your camera will offer you the kind of access you need on the move. Q: Are Camera Backpacks Safe? What If I Drop My Bag? A: The best camera backpacks are designed to be safe. They are made from tough materials that can withstand the elements and are hard to tear or cut. They are also rigid and thickly padded. In case of an accidental drop, a well-built and padded camera bag or backpack can mean the difference between a functional camera and a broken one. The impact from the drop will be absorbed by the materials and padding instead of your precious camera equipment. However, camera bags aren’t impact-proof. While your camera and lenses may survive a minor, gentle fall if you have a bag with substantial padding, the physical trauma from frequent drops or a really serious drop can still lead to failure or breakage of your camera equipment. Q: Can I Use My Camera Backpacks For Other Things? A: It is up to you to decide whether to use the camera backpack specifically for your camera and its accessories or use it for other things as well. Most travel camera bags have a compartment for carrying a laptop or tablet while some even have extra storage space for personal items such as snacks, maps, clothes, a first aid kit etc. There are also convertible camera backpacks where the camera compartment is removable to convert it into an everyday backpack you can use for other things other than photography equipment. Capturing the beautiful sceneries and moments you enjoy on your adventures is a must. Taking your camera on the road or trail requires a high-quality backpack. It is important to invest in the best travel camera bag possible to protect your valuable equipment while making it easy to carry around and offering fast access to your gear. A great camera bag for travel will be tough, comfortable to carry and protective of your camera and accessories. Finding the best camera backpack is easier when you know what you want from the backpack and how you will be using it and our guide covers what you need to look for to determine your best choice. You also can’t go wrong with any of our top picks. Happy adventuring and shooting! How about you? Which of the photography backpacks on our camera backpack reviews is your top choice? Do you own a great camera bag for hiking and travel that we haven’t included here? Share your thoughts and experiences in the comment box below!